Australia’s scorching sun and mineral-rich soil provide excellent conditions for growing grapes. Australians’ innovativeness, adventurism and love of alcohol has led to the production of some of the finest wines in the world. 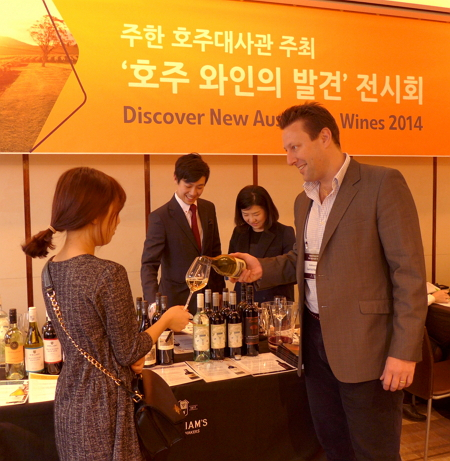 In an effort to get more of this wine flowing in Korea, the event “Discover New Australian Wines 2014” was held at Westin Chosun Hotel in Seoul on Nov. 24, introducing 170 premium wines from 21 wineries in Australia to Korean importers, retailers and journalists. Australia has 65 major winemaking regions, making it the world’s sixth-largest producer after France, Chile, Italy, the United States and Spain. The island continent’s sundry terroir, including the Riverina, Tumbarumba, Hilltops and Orange regions, produces a full spectrum of flavors that range from full-bodied to light. The mineral content in the water holds its tannin structure, which preserves the taste as it ages in the barrels. Due to temperatures that reach above 45 degrees Celsius during midday in Australia, Aussies don’t romance about handpicking grapes in centuries-old orchards as much as their European counterparts, Ferrari said. “However, one can still find traces of the European heritage in Australia’s Little Italy, Little France and Little Germany,” she added. Ferrari’s brand of Ulupna wine comes from the Goulburn Valley in southeastern Australia. Ulupna produces “single vineyard wine,” made with grapes straight from the company-owned vineyard. Depending on the earthly elements they grow from, the grapes can give birth to a range of colors and flavors: Shiraz, chardonnay, Semillon, pinot noir, cabernet sauvignon and cabernet merlot. As a general rule, Harvison said, the wine’s taste is enriched and refined as it matures inside the barrel. McWilliams’ flagship wines are left in their casks for between 18 and 24 months, and once bottled, are aged for up to 50 years. Harvison said that, as citizens of a wine-producing country, Australians have a “high tolerance for wine.” Although the legal drinking age is 18, most people grow up drinking wine at the dinner table or at barbecues in the park, he said. As people move from punch-drunk evenings to tipsy fine-dining in Korea, Harvison said, Korean connoisseurs will side with the healthier option of wine, which is thought to lower cholesterol and break down fat. Theresa Kim from the Australian Trade Commission said that Australian wine will become popular again in Korea as the two countries recently signed a free trade agreement. The elimination of a 15 percent tariff will make Australian wine more competitive, and it will keep flowing into the unsaturated market in Korea, Kim said. “Winemakers in Australia have continually innovated their practice to create new products. I’m sure Koreans will enjoy the sparkling Shiraz, which goes well with eating a turkey during Australia’s summertime Christmas,” she added.